Are your models really made of LEGO? Yes! Our models are built using only LEGO parts. I have an idea for something I would like to see built out of LEGO. Can you build it? Yes! Please contact us so that we can discuss your project and develop a proposal that will meet your needs, timeline and budget. Who have you built models for previously? We have previously completed models for China Oil Services Limited, The Calgary Public Library Foundation, The Calgary Municipal Land Corporation, WestJet, Devon Energy, Suncor, Grizzly Oil Sands and private citizens, among others. I don't live in Calgary. Can you ship a model to me? Yes! We will work with you to securely transport the model and ensure that it is setup at your site. Can I buy a model that is pictured on your website? Maybe. Some of the models featured in our list of creations are still together. Others have been disassembled. Please contact us for details. Why are your models so expensive? Custom models can cost anywhere from $0.25 to $1.00 per piece. Commercially produced models typically cost somewhere between $0.10 and $0.25 per piece. This difference occurs because Lego is able to produce whatever pieces it wants in whatever quantities are needed. Lego is also able to spread the design costs over tens of thousands of units. As a result, it simply isn't possible to design and build custom models for the same price as commercial sets. For smaller projects ($500 or less) we accept payment by credit card, email money transfer or cash. Larger projects can be paid by email money transfer or bank transfer / wire transfer. Cheques may also be accepted in some cases. Are your models glued together? We believe that one of the great things about LEGO is the ability to experiment and make changes to the model. If we glued our models together we would lose that flexibility. As a result, we only glue models for commercial projects where glue is specifically requested by the client. How long did it take to build that model? It depends. The New Central Library model took months to build while the snowman was built in a weekend. Other models have taken as little as a couple of hours or as much as several months. How long have you been building with LEGO? Like most people I started building with LEGO as a child but stopped when I was a teenager. I started building again when I was in graduate school. I don't plan to stop building again until I get too old to bend over and pick up the pieces that fall on the floor. Where did you get so much LEGO? Most of my LEGO is purchased at retailers like The LEGO Store and Walmart, ideally when it is on sale. I also occasionally purchase LEGO from www.bricklink.com. What are you going to build next? That's a secret! Our new projects will appear in our list of creations as they are completed. Where has your work been displayed? Our work has been displayed at numerous venues around Calgary. These include The LEGO Store at Chinook Center, Brick Roundup , Brix 'n' Blox, numerous community Lego building contests, TELUS Spark, and Calgary Public Library branches. My work has also been part of displays presented by the Southern Alberta Lego Users Group at Supertrain and the Calgary Comic and Entertainment Expo. Altered Egos, UCalgary Alumni Magazine, Fall / Winter 2017, p15. Calgary's Lego library, CTV News, April 15, 2016. A Look Inside Calgary's Lego Library, Avenue Magazine, April 11, 2016. Calgary central library project gets $1M donation, CBC News, October 4, 2015. New Central Library gets $1 million donation from Mike and Linda Shaikh, Calgary Herald, October 3, 2015. LEGO ‘Nenshi’ figurine part of New Central Library Kickstarter campaign, Global News, October 3, 2015. Calgary's new Central Library gets big boost from city philanthropist, Calgary Sun, October 3, 2015. No. Here's a link to my webpage at my "real" job. 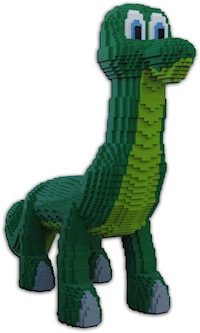 Copyright (C) 2019 Ben's Bricks Ltd.
Last modified: March 24, 2019 2:43:53 AM UTC.